A committee tasked with making recommendations to the Anchorage School Board endorsed a plan Friday to fix a pair of Eagle River schools damaged by the Nov. 30 earthquake. The ad hoc committee made up of school board and community members also voted to ask the board to form a new committee to address the future needs and look at other options for improving education opportunities for area students. That request came out of a discussion about programming needs at Eagle River and Chugiak High School, where parents and administrators said low enrollments have cost opportunities. “We can’t forget this frustration, folks,” said committee member and community activist Debbie Ossiander. The committee began its meeting at Eagle River High School by looking at figures showing the estimated cost to fix or repair both schools, which have been closed since the magnitude 7.1 quake. According to the district, fixing Eagle River Elementary -- including earthquake repairs, a new roof and seismic upgrades -- would cost about $12.1 million and take about 24 months while building a replacement on the same site would cost $34.9 million over 34 months. Fixing Gruening -- which also needs earthquake repairs, seismic upgrades and a new roof -- would cost $24.2 million and 24 months while replacing the school would cost $76.7 million. The cost to demolish and replace both schools would be about $111 million. The costs are rough estimates based on engineering reports so far received by the district. Final engineering reports have not yet been finalized but should be available by the March 18 school board meeting. District officials said the tentative plan would be to bond for the repairs with the expectation the state and federal governments would help cover some of the cost through emergency funds. Preliminary design work could begin as soon as this spring, with the roughly $4 million needed for design work coming from existing funds. 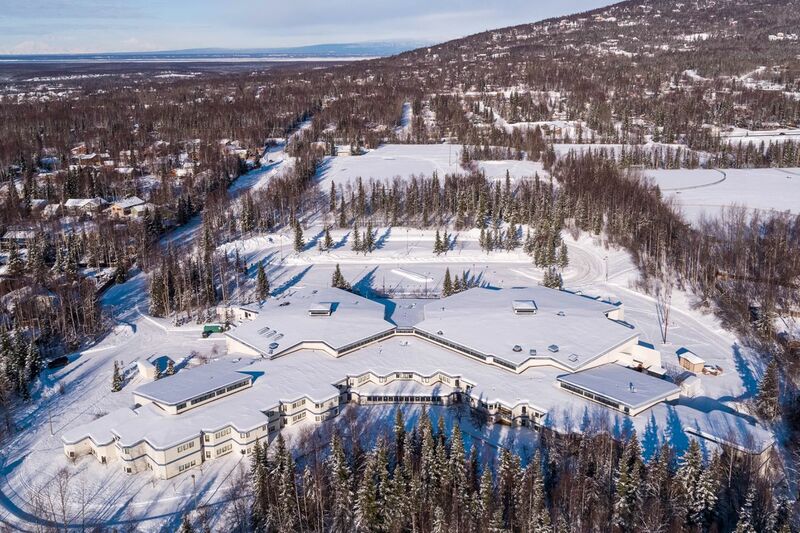 The decision to rebuild Eagle River Elementary was quick, but the discussion on Gruening -- which has a long history of design flaws -- took longer. Officials said a new roof design will help alleviate well-documented concerns about the building’s design. “We know that roof at Gruening has got some challenges, it’s not a good design,” Roth said. No final decisions have been made. The next step in the process will be for ad hoc committee chair Elisa Snelling to present the committee’s recommendation to the school board, which will have a special meeting Monday to have a first reading of the proposed action plan. The board is expected to vote on the plan at its regular March 18 meeting. Marsett said she also plans to form a new ad hoc committee per the existing committee’s request. If the board agrees with the committee’s decision to rebuild the schools, design work could start almost immediately. “We’re really trying to get the design piece now,” Anderson said. Funding the projects is still an open question, but district officials say they’re confident Anchorage voters will approve bonds for the repairs. A $59 million school bond on the April 2 ballot already includes a new roof for Eagle River Elementary and $4 million for earthquake repairs. Combined with the clear need for repairs and possibility of federal and state reimbursement, Roth said he thinks voters will support bonds for the work. “There is a great deal of optimism,” Roth told the committee. “That’s our real fear,” Senden said. Elementary school parents and teachers said they’d also like the new committee to look at fixes for their schools — some of which are well over (and under) capacity. School board president Starr Marsett told the committee she intends to grant its request. One idea that has been widely circulated for secondary schools would be to close Gruening and combine Chugiak and Eagle River into one high school on the CHS campus -- where Gruening students now attend classes. That’s still a theoretical option, but ASD chief financial officer Jim Anderson said the idea isn’t nearly as simple as some might think. While there could be some costs savings associated with consolidating schools, there would also be costs associated with the consolidation itself. For example, a combined school might seem like it would need fewer buses and coaches for athletics, but Anderson explained a larger high school might then need to field more C teams. “A lot of this stuff ends up washing out,” said Anderson, who also noted smaller schools receive more funding per student than larger schools. Additionally, although the two local high schools are currently below enrollment, that may not always be the case. Long-term forecasts show the municipality’s population is likely to grow the most in Chugiak-Eagle River, according to ASD chief operating officer Tom Roth. “In time, these areas are going to fill in and a lot of this population shortfall is going to self-correct,” Roth said. Ossiander said it would be a mistake to give up on any of Chugiak-Eagle River’s four secondary schools. “Chugiak-Eagle River wants and needs those schools," she said. But while combining high schools might not be the best solution, committee members agreed the earthquake has shaken loose other lingering problems that must be addressed. “It is this burbling discontent in the Chugiak-Eagle River community,” Senden said. Eagle River Elementary principal Lisa Prince said the community needs to have more input going forward on what’s going to happen in local elementary and secondary schools over the next few years. “People are expecting some kind of discussion,” she said.